Are you a roller coaster or a roller can’t-er? El LOVES going on big high upside downy type rides and having a good scream. Jae likes standing on the ground with two feet nice and solid and stomach where it is meant to be, not churning up inside your neck. This summer we will find out which is best when we go for a day trip to Thorpe Park as they have given us some tickets. We’re going to go during the Sun Scream event which runs from Wednesday August 23 to Sunday September 1. This will include lots of free family fun extras, including daytime silent discos, adrenaline-fuelled stunts, plus freestyle hip-hop and beatbox performances and workshops. 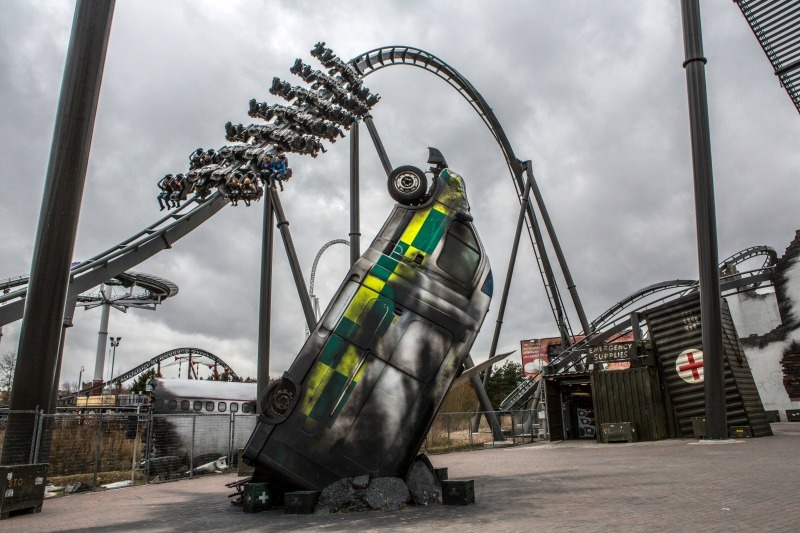 If you buy a full-priced ticket, for a little bit extra you can upgrade it to a Thorpe Park Annual Pass, giving unlimited access to the park for the rest of the season until it closes on 4 November, 2013. There are plenty of rides that all the family can enjoy, such as Zodiac and manic carpet ride Quantum as well as the Flying Fish. Jae likes the sound of Flying Fish. If your kids are after something a little edgier, and if they’re 1m or taller, they can experience the thrill of the newly refurbished X, an illuminated ride through dynamic coloured lighting. Jae also likes the sound of dynamic coloured lighting, it sounds a bit like a roller disco. For extreme thrills, older children over 1.4m can now brave it backwards on the Swarm! That’s Swarm pictured at the top of this post. Jae doesn’t like the sound of that so much, but El does. She would have to hold on to her books pretty tightly though. Are you a roller coaster fan? Do you think Jae should brave the big rides, or stick to embarrassing El by participating enthusiastically in the silent disco? August 12, 2013. Tags: thorpe park. Uncategorized. Personally I would rather like to see Jae featured in that video, so yes, get on those Coasters! August 15, 2013 at 9:22 am. Permalink. Flying fish is ok for a warmup, and one of the only rides where you may get a go again without queuing – it is a ride more fitting to Chessington than Thorpe. And Jae, if you want to upgrade from wimping out on Flying Fish, I’d suggest Nemesis Inferno – it’s less scary than it looks, as being an hanging ride, it tends to be smooth. By comparison, the twist section of Colossus, I’m not a fan of. PS. Tidal wave… when they say “You will get wet”, they are not just covering themselves for a bit of a splash … you will end up like a drowned rat! August 16, 2013 at 4:14 pm. Permalink.